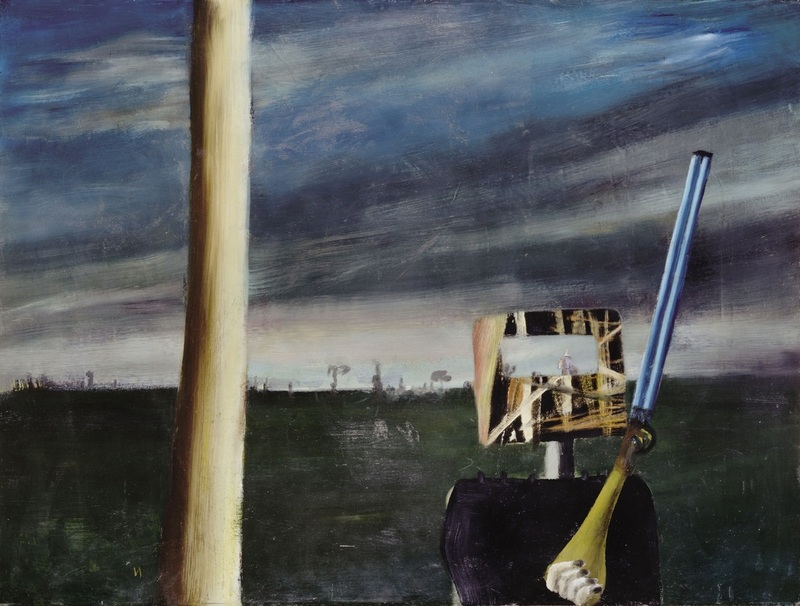 This is one the most ambiguous and evocative paintings in Nolan’s first Glenrowan sequence. Here we see Ned Kelly alone in a dark, featureless landscape, against a leaden grey sky. The painting expresses a sinister almost claustrophobic mood. Kelly appears in the foreground, assertively holding his rifle upright, and through the aperture of his helmet we see the figure of a policeman on horseback right in Kelly’s firing line. However, Kelly appears tentative and it is unclear if he seeks refuge or revenge. In contrast to other works where Kelly’s helmet is pure black, here it has been painted with slashes of black, brown and white, colours which evoke the bush, using a technique that, together with the tempestuous sky, evokes an abstract and destructive force.